Theodore Martin was the son of a solicitor from Edinburgh. He worked as a solicitor in that city between 1840 and 1845. Then he moved to London to head Martin and Leslie, parliamentary agents. In 1845 his "Bon Gaultier Ballads", written together with W.E. Aytoun, wee published. He translated works by Dante Schiller and many others, but he is best remembered as the official biographer of Prince Albert. Queen Victoria had asked him to write it and "Life of the Prince Consort" was published between 1874 and 1880. It earned him the queen's lifelong friendship. In 1851 he married the actress Helena Faucit. He had courted her since 1843. In 1889 they were visited by Queen Victoria in their home near Llangollen in Wales. His wife died in 1898. Martin continued his literary work and published "Monographs" in 1906. After his death in 1909 he was buried beside his wife at Brompton Cemetery in London. 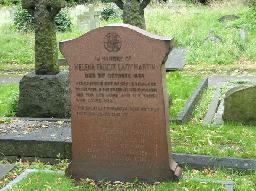 The grave of Helena Faucit at Brompton Cemetery, London.